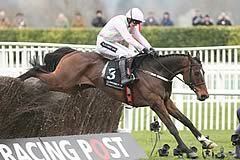 Once again, Willie Mullins' superstar was backed as if defeat was out of the question and that is how it proved, with the 1/8 favourite jumping quickly and accurately in second as Alisier D'Irlande set the pace. Ruby Walsh took closer order to touch down over two out in a share of the lead and then let out an inch of rein for Douvan to coast clear. He negotiated the last with the minimum of fuss and strolled across the line with eight lengths in hand of Sizing John. Walsh said: "He's a very good horse. He settled really well and jumped super. "Alisier D'Irlande brought us a really good gallop. I cruised up to him over the second-last and he didn't do a whole pile then. I got a bit close to the last, but horses have to learn how to get themselves out of those situations. "He just has a huge amount of ability. In time you probably could (step up in trip), but Willie is very conscious of developing these horses' careers and going the right way about it. "Douvan is still a very young horse, he has a lot of racing in front of him." Asked whether he could see Douvan taking on his Tingle Creek-winning stable companion Un De Sceaux at some stage this season, the jockey added: "I'm sure you probably could. Un De Sceaux I think will probably go to Ascot in January and I'm sure they will take each other on somewhere." Mullins said: "Every time a horse like that runs I have my heart in my mouth. He did what we hoped and we didn't learn anything new. "He's got spectacular scope and anyone that rides him just says he has a different gear. All the others around you are paddling looking to go faster while you are sitting on him. "He just has a huge stride and does it effortlessly. "My main aim now will just be to keep him sound and keep him well. His ability should carry him through most of what's ahead, I hope. "He's a lovely horse in the stable and a kid could lead him up in the yard. He has a beautiful temperament and he's got such size. "When you stand in to him you have to look up to him - you don't realise it. "He's a well put together horse and when they are well put together they look smaller than they are and then you stand into them and you see how huge they are. He's one of the biggest we've ever had. "On immediate plans, Mullins added: "I don't plan these things. When the horse is sound going home then I look. "We'll maybe look at the Tied Cottage (at Punchestown). We'll look nearer home than having to travel anyway. "Like a lot of my horses I was wondering was he the same Douvan in his first few bits of work this year. I wasn't at all impressed with him. "He has a new rider now with Holly (Conte) riding him instead of Gail (Carlisle). Holly rode him work differently. I asked her to talk to Gail about him and she did. Things just improved from there. He went on: "He would be potentially the best steeplechaser or horse we've had. It's hard to see us having one better than Hurricane Fly, but he never jumped a fence. "I'm hoping this fellow will do more over fences than anything we've ever had. He has huge potential. "I'm keeping my fingers crossed that he stays sound and we'll stay on the two-mile route as long as we can anyway. "If we decide to go up in trip that will be another day's work. I've no interest in even thinking about it this season. As far as I'm concerned we are on the two-mile route this year. "I'm just taking it one day at a time and aiming for the next race. I don't see any need to move off that trip."